These cute invitations are sure to let guests know there's a pirate party afoot! 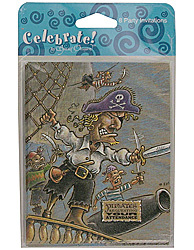 Featuring a vintage-styled pirate design on the front, the inside prompts the party givers to provide all the necessary information like who the party is for, where and when it is and who is giving the party. Set of 8 invitations includes envelopes.